This is a gripping and balanced account of the history of St. Joseph’s Mission near Williams Lake, BC from its establishment by the Oblates of Mary Immaculate in 1867 to its take over by the Canadian Government in 1964. Margaret Whitehead is a trained historian specializing in Church studies – specifically Oblate and First Nations history. As an Oblate Associate and former B.C resident, I enjoyed learning more about this part of the Oblate missionary story in Canada. The Oblates built this mission as a base for evangelizing and educating the Carriers, the Shuswaps and Chilcotin indigenous bands. Early on, they encouraged what had been migrant groups, to settle near to the mission and so they could be taught how to grow corn, vegetables and raise cattle to better sustain themselves. They also taught these natives about God and the Catholic faith. Only after behaving well (no intoxication, no seeing the Shaman or wild dancing and singing) for a whole year, would they baptize those who consented. Progress was slow at first, particularly with the aloof Chilcotin. The Shuswap and Carrier bands already believed in a deity and life after death, so they found the Christian faith not unsimilar to their own. In 1890 both a girls and boys residential school was established at St. Joseph’s to teach trades and English to the children. 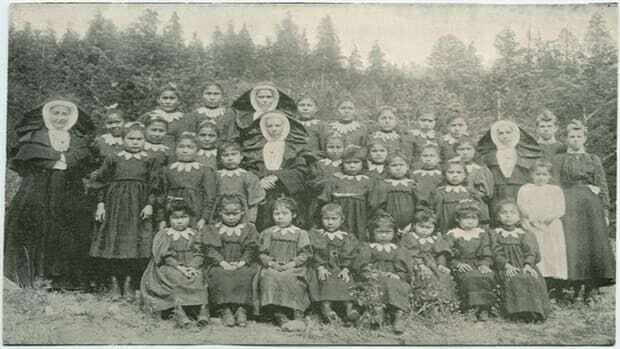 Initially skeptical, First Nations parents were wary of sending their children to these boarding schools where the elements of their local culture and language were repressed and free spirited children were confined. With good intentions, the Oblate Fr. and eventual Bishop Paul Durieu implemented a rigid system that made use of spies, capital punishment and fear to impose a European colonial type education (the only one they knew), on indigenous students that in the process discarded their cultural heritage. There were many runaways and the occasional deaths due to exposure or disease. Gradually however, the benefits of learning to read and write and speak English were seen as assets by the natives and enrollment increased, albeit as decreed by law. One of the darkest times for Canada was the government’s banning of the Potlach ceremony where a (rich) host group would hold a big feast and give away all their possessions to their friends, to obtain greater glory. The Oblates opposed this practice on moral grounds because they thought it undermined the economic well-being of the natives, encouraged wild practices and posed a health hazard to children. 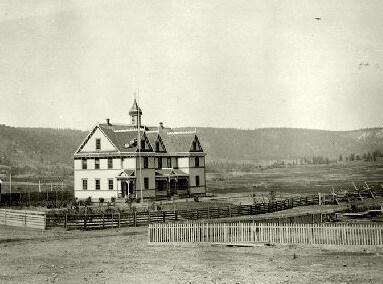 Vancouver Sun photo of the abandoned boys residential school near Williams Lake, B.C. In the words of Bud Felker who attended the St. Joseph’s Mission school in the early 1900’s: “I tell you, no fooling, it was a pretty good school….I meet some of the Indian men who went to school with me and they say ‘Not too bad a place that Mission School. '” According to the author, the younger generation did not agree. They resented the part played by the Mission in undermining their cultural heritage. 9.5 out of 10, a very well written and researched account of raw Canadian history.